Or view larger version. 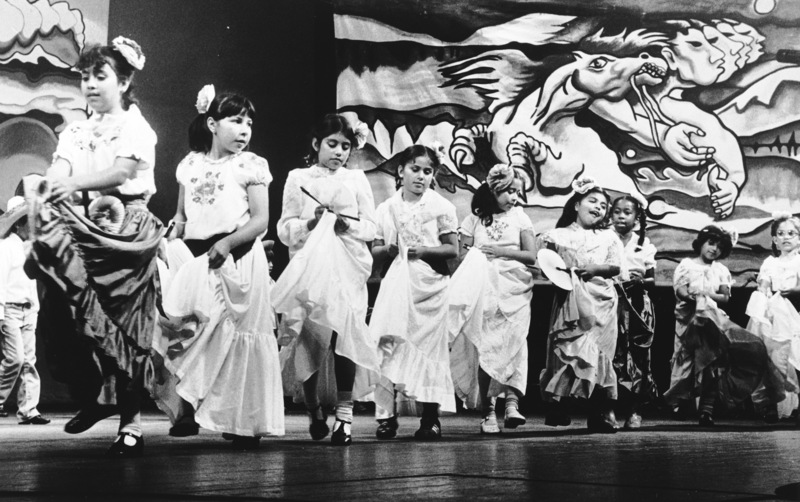 School children dance to celebrate Cinco de Mayo at the Laney College Theater in Oakland, California. May 5, 1982. Ron Riesterer, photographer. Gelatin silver print. Collection of Oakland Museum of California. The Oakland Tribune Collection. Gift of ANG Newspapers. In this 1982 photo, a group of Oakland school children celebrate Cinco de Mayo, an event that recalls Mexico's victory against Napoléon III's army in 1862. California's ethnic population of foreign-born Latinos-while larger than that of any other state in the U.S.-historically had the least amount of political power due to the low number of registered voters. In the 1980s, groups such the Southwest Voters Project and the Mexican-American Legal Defense and Education Fund sought to educate and naturalize California's immigrants. Over the coming decades, they successfully argued that the choice to maintain one's Mexican citizenship actually disenfranchised long-term residents and excluded them from the political process.